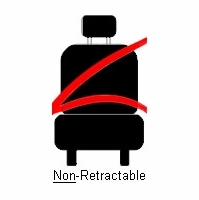 Retractable 3 point seat belts retract automatically and conveniently out of the way into the retractor box once you unbuckle. And non-retractable seat belts... well... they don't! All of our replacement seat belts are U.S. Federal Motor Vehicle Safety Standards (FMVSS) #209 & #302 approved.